첫 번째 원고에서 우리는 크리스마스의 역사와 덴마크인이 12월24일 크리스마스 이브까지 손꼽아 기다리며 하는 소소한 일을 알아봤다. 이번에는 크리스마스에서 가장 중요한 4일을 더 자세히 들어보자. 23·24·25·26일이다. 그리고 정말로 중요한 요소를 알아보자. 바로 술! 덴마크 사람을 아는 사람은 당연히 알거다. 덴마크인이 사랑하는 사람과 함께 먹고 마시는 일을 얼마나 사랑하는지를 말이지. 크리스마스라고 예외는 아니다. 11월 초에 덴마크인은 J데이(J-dag)라고 부르는 것을 기념한다. 바로 이 날 덴마크 크리스마스 맥주(Tuborg Julebryg)가 출시된다. 덴마크에는 불문율이 있는데, 크리스마스 맥주가 나오기 전에는 크리스마스 런치를 시작할 수 없다는 거다. 11월 시작부터 1월까지(몇몇 경우에는 2월까지도) 덴마크 사람이 무척 바빠지는 걸 볼 수 있다. 직장 동료나 가족과 크리스마스 런치를 즐기다보면 주말이 금새 스쳐간다. 크리스마스 런치라고 부르기는 해도 꼭 점심식사여야 하는 건 아니다. 낮이나 밤이나 상관 없다. 맛잇는 음식과 게임, 음악, 웃음이 가득하다면 그 시간이 크리스마스 런치다. 우리 가족이 지키는 전통이 한 가지 있다. 할아버지와 할머니가 12월 초에 가족을 위해 크리스마스 런치를 연다. 가족 모두가 덴마크 곳곳에 흩어져 살기 때문에 1년에 한 번 크리스마스 런치에 비로소 온 가족이 한 자리에 모인다. 우리가 할아버지댁에 도착하는 동안 내 ‘새 할머니’가 요리를 마무리한다. 특별한 점심을 먹을 때 우리는 전통적으로 생선과 빵으로 식사를 시작한다. 빵은 호밀빵과 일반 빵을 함께 준비한다. 생선도 다양한 종류를 준비한다. 최소한 5가지는 상에 올린다. 연어, 생선가스, 고등어, 새우, 청어 등등 많다. 이게 전체 요리로 먹는 찬 음식이다. 다음에는 따뜻한 음식이 상에 오른다. 고기부터 감자, 그레이비 소스 등 다양한 음식을 함께 먹는다. 내가 아무리 열심히 노력해도 음식이 몇 접시나 나오는지 도저히 셀 수가 없다. 무척 많은 음식이 나오기 때문에 뷔페 같을 거다. 한 차례 음식을 흡입하고 나면 쉬어야 한다. 그럼 소파에 기대 앉아 주면 사람과 이야기를 나눈다. 이제 디저트를 먹으며 게임을 즐긴다. 물론 술도 한 잔 마셔야지. 한국에 소주가 있다면 덴마크에는 스냅스(snaps)가 있다. 가장 전통적인 것은 올보그 스냅스(Ålborg snaps)다. 맞다. 도시 이름을 따왔다. 우리가 식사하는 동안 누군가는 계속 “건배”와 “메리 크리스마스(glædelig jul, god jul)”를 외칠 거다. 이제껏 먹고 마셨다. 이제 슬슬 알딸딸하지? 그럼 이제 더 먹을 때다. 디저트로 우리는 늘 크래커와 치즈를 먹는다. 휘핑 크림과 다진 아몬드를 넣은 차가운 쌀 죽 라이살멘트(risalmente)도 먹는다. 죽 위에 뜨거운 체리 소스를 겻들이기도 한다. 식사를 마쳤으면 이제 남은 저녁 시간을 즐기자. 우리는 이런 시간을 “휘게(hygge)”라고 부른다. 마시고 떠들고 음악을 듣고 다양한 게임을 즐긴다. 여러분을 집에 태워줄 친구 한 명만 맨정신이면 된다. 이 기회에 우리는 선물을 교환하기도 한다. 이제 크리스마스 카운트다운이 더 가까워졌을 거다. Original article in English is below. Korean article was translated by Sang-uk Ahn editor. 이제 크리스마스가 임박했다. 12월23일은 작은 크리스마스 이브라고 부른다. 만일 크리스마스 쇼핑할 시간이 없었다면 이 날이 마지막 기회다. 어린이와 학교에 다니는 젊은이는 드디어 책을 내려 놓고 크리스마스 방학에 들어간다. 덴마크인은 12월23일마다 바쁘다. 옛날에 12월23일은 빵 굽는 날이었다. 쿠키, 케이크, 사과파이(æbleskiver) 등 온갖 크리스마스 간식을 이날 구웠다. 오늘날은 많이 달라졌다. 물론 우리는 여전히 바쁘다. 크리스마스 이브를 앞두고 준비할 일이 산더미다. 선물 포장해야 하고, 크리스마스 트리도 장식해야 하고, 쌀죽도 만들고, 이것도 하고 저것도 하고…. 보통 나는 가족과 할머니댁에 간다. 이모, 삼촌, 조카도 간다. 당연히 내 부모님도 함께 가고. 하지만 구성원이 계속 생기기에 우리 가족은 계속 늘어난다. 그래서 23일을 기념하는 일을 여름에 하기로 했다. 여름에는 모두가 모여서 함께 여행을 갈 수 있으니까. 12월24일을 기념하는 일은 아주 오랜 전통이다. 크리스마스 바로 전날이기 때문이다. 우리가 크리스마스 당일을 기념하지 않는 것은 아니지만 선물을 교환하고 크리스마스 저녁을 같이 먹는 일은 24일에 한다. 덴마크인은 더이상 기독교에 목매지 않는다. 그래도 크리스마스가 다가오면, 특히 24일에는 대다수 덴마크인이 교회에 간다. 이날 교회에 가는 사람이 무척 많아서 하루에 3번 이상 예배가 열린다. 가족마다 크리스마스를 즐기는 방식은 다르다. 3년 전까지는 나와 부모님만 조촐하게 지냈다. 그 뒤로는 늘 할머니와 함께 했다. 하지만 내가 덴마크식 크리스마스를 체험하도록 한 한국인 친구를 초대한 뒤로 우리 가족은 전통을 바꿨다. 그 뒤로는 크리스마스에 친구(대다수는 한국인)를 초대하는 것이 우리 가족의 새 전통이 됐다. 옛날에 나는 크리스마스 트리를 장식하며 크리스마스 아침을 보내곤 했다. 지금은 여기저기서 친구들을 태워서 내 부모님 집으로 데려간다. 모두 모여 장식을 만들고 크리스마스 트리를 함께 꾸민다. 엄마는 주방에서 요리하느라 하루 종일 바쁘다. 짬을 내 교회에도 간다. TV에서는 다양한 크리스마스 특집 쇼와 영화를 보여준다. 모든 채널에는 저녁 6시를 카운트다운하는 작은 시계가 떠 있다. 크리스마스 디너 시간이다. 크리스마스 이브에 우리는 전채요리를 먹지 않는다. 바로 메인 코스로 들어간다. 감자만 세 종류를 먹는다. 보통 먹는 하얀 감자, 달콤한 갈색 감자, 감자칩이다. 고기로는 구운 돼지고기(Flæskesteg)를 먹는다. 삼겹살하고 같은 부위다. 뢰드콜(rødkål)이라고 부르는 붉은 양배추도 먹는다. 채썰어서 특별한 요리법으로 삶은 뒤 따뜻하게 먹는다. 마지막으로는 돼지고기를 구울 때 나온갈색 육수를 마신다. 이렇게 저녁을 먹고 나면 잠시 쉰다. 무척 부담스러운 식사니까. 디저트로 우리는 크리스마스 런치처럼 쌀죽을 먹는다. 하지만 크리스마스 디너에는 죽을 먹으며 한 가지 게임을 한다. 죽을 나눠 담을 때 한 그릇 안에는 아몬드 한 알을 통째로 넣어둔다. 이 아몬드를 찾은 사람은 선물을 받는다. 작은 트릭이 있는데, 이거다. 죽을 먹다 아몬드를 발견했어도 입 안에 숨기고 끝까지 모른체 해봐라. 재밌는 상황이 펼쳐진다. 저녁 식사를 마치고 나면 커피 또는 차를 끓인다. 크리스마스 사탕도 준비한다. 우리 집은 크리스마스 트리를 2층에 두기 때문에 모두 올라가 둘러 앉아 한동안 얘기를 나눈다. 선물을 열어보려면 먼저 과제를 수행해야 한다. 춤과 노래다. 크리스마스 트리 주변을 빙 둘러 선다. 그리고 덴마크 크리스마스 노래를 부르며 트리 주변을 빙빙 돈다. 나는 늘 이게 싫었다. 지루하다고 생각했다. 그리곤 한국인 친구들이 함께하기 시작했다. 미리 일러둬야겠다. 나는 내 친구들을 정말 사랑한다. 이 친구들은 덴마크어 노래를 따라 부르지 못하는데도 최선을 다했다. 덕분에 이 지루했던 시간이 퍽 재미난 순간으로 탈바꿈했다. 과제를 마쳤으면 드디어 선물을 열어볼 시간이다. 보통 덴마크인은 부모님, 양부모님, 조부모님, 이모, 삼촌, 친구 그리고 나머지 가족한테서 선물을 한더미씩 받는다. 하지만 이제 우리 가족은 한 명이 선물을 한 개씩만 받는다. 내 친구들을 배려하려고 새로 만든 전통이다. 우리 가족은 23일이나 25일 선물을 연다. 우리 가족의 경우만 그렇다. 다른 사람이 선물을 열어보는 동안 크리스마스 사탕을 먹으며 커피나 차를 마신다. 때로는 술을 겻들이기도 한다. 원래 전통적으로 크리스마스는 술 마시며 축하하는 날이잖나. 그래서 크리스마스에 고주망태되기(drinking in the Christmas)라는 말도 있잖나. 하지만 지금은 옛날 만큼 술에 취하는 일은 드물다. 곤드레만드레 취하기는 새해를 위해 아껴둔다. 선물이 바닥나거나 사람들이 모두 취하거나 지쳤을 때는 그냥 잔다. 덴마크식 휘게(hygge)로 가득한 밤이다. 25일과 26일은 가족 또는 친구와 함께 기념하는 날이다. 하이라이트는 전통 크리스마스 런치다. 만일 자기 집에서 크리스마스 런치를 먹지 않는다면 친적이나 친구 집에 간다. 우리 가족은 작은 편이어서 25일이면 늘 이모나 삼촌 집에 가곤 했다. 26일은 가족의 친구들과 보냈다. 며칠 연속으로 엄청나게 많은 음식을 먹어치운데다 음식도 죄다 기름지기 때문에 25일부터는 긴 찬색을 하며 신선한 공기를 쐰다. 가족이 시골에 산다면 음식을 더 먹기 전에 숲 속을 거니는 것만큼 멋진 일도 없다. 한가지 경고할 게 있다. 과식하지 않도록 주의하라. 왜냐면 이맘 때에 덴마크 병원이 제일 미어터지기 때문이다. 바로 여러분처럼 과식을 피하지 못한 미련한 사람들로 말이지. 덴마크식 크리스마스의 모든 것을 알아봤다. 이제 크리스마스를 즐기며 아래 동영상을 틀어볼 수 있을 거다. 성인용 크리스마스 캘린더에 나온 노래다. 덴마크어랑 영어가 뒤섞이긴 했지만 괴상한 덴마크식 유머를 잘 보여준다. The building is a famous Theater in Tivoli that always has Christmas trees and the soldiers from the nutcracker on display. In the first part we learned about the history of Christmas and some of the small things we do while we count down for the 24th – Christmas eve. This time we will look on the 4 most important days in the Danish Christmas – the 23rd, 24th, 25th and 26th. But before that we need to look at something even more important – Drinking!. If you know Danish people you know how much we love drinking and eating together with our loved ones. Well Christmas is no exception. In the beginning of November we celebrate something called j-dag (j-day). 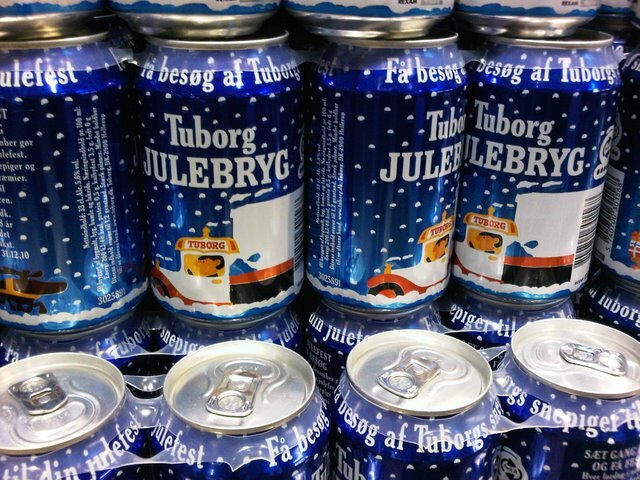 It’s the day where the Danish Christmas beer is released – Tuborg julebryg. As an unwritten rule we can´t start our Christmas lunches before this beer is available. So from the beginning of November to January (few cases February) you will see that Danish people become very busy. Christmas lunch with work and family is something that takes our weekends away. Even though it’s called a Christmas lunch the time of day is irrelevant. It´s a day or evening full of good food games music and laughter. in my family we have a tradition that my granddad and his wife throw a Christmas lunch in the beginning of December for the family. We are all living different places in Denmark and this is that one time a year we all get together. While we arrive to their house my “step grandmother” is finishing up the food. As a tradition when we have special lunches we always start with fish and bread (black and white bread) but it’s not only one kind of fish. It’s at least 5 different kinds – salmon, fish filet, Markel, shrimps, herring and so much more. This is primarily the cold dishes. After this the warm dishes will be served. you will find anything from meat to potatoes to gravy. now no matter how hard I try I can’t put a number on how many dishes there are. Depending on where you are this is a buffet because of the many dishes. After this you’re going to need a break from the eating. So sit back relax and talk with the people around you. Now before we go on to dessert and games let’s talk about drinking. Korea has soju and Denmark has snaps. A classic is Aalborg snaps (and yes it’s named after the city). So while we are eating someone is always saying cheers and glædelig jul / god jul (Merry Christmas). So by now we have been eating and drinking and we are pretty tipsy. So let’s eat some more. For dessert we always get crackers, cheese and risalmente – cold rice porridge whipped in whip cream with chopped almonds. You can add a hot cherry sauce on top of it. Once we are done eating we spend the rest of the evening by “hygge” as we call it. We drink, talk, listen to music and play different games. Just make sure that at least one of you is sober to drive home. We also use this opportunity to exchange gifts between each other. So now the countdown for Christmas is even closer. So now that time is closing in. It’s the 23rd of December also known as little Christmas eve. If you still miss some Christmas shopping this is your last chance. All the children and young people that are studying can finally stop and go on their Christmas vacation. It has always been a busy day for the Danish people. In the old days it was a baking day. All sorts of Christmas cookies, cakes and æbleskiver were baked that day. However it’s a bit different today. Of course we are still busy. There are a lot of things that need to be prepared for the 24th. Presents that need to wrapped, a Christmas tree that needs to be decorated, the rice porridge needs to be made and so on and on. For me and my family we used to go to my grandmother’s house with my aunt, uncle, cousins and of course my parents. However since the family is growing with new members we need to celebrate the 23rd doing the summer so everybody can be there and we can go on a trip together. As a very old tradition we always celebrate days like the 24th of December because it’s the evening before the actual day. It doesn’t mean that we don’t celebrate the 25th but the whole thing of giving gift and the Christmas dinner is the 24th for us. Now Danish people are not famous for being religious but when it comes to Christmas especially on the 24th most people go to church. It’s so popular so that it’s normal that there’s a serves at least 3 times doing that day. It’s different in each family how you celebrate Christmas. Until 3 years ago, it was only me my parents and every other year my grandmother. But we changed our traditions when I invited one of Korean friends to spend Christmas with us so she could experience a Danish Christmas. Ever since that Christmas it’s become our new tradition to invite friends (mostly Korean people) to come and celebrate with us. In the old days I would spend the morning decorate the Christmas tree. Now I spending the morning with picking up friends from different places and get them to my parents’ house. We make some Christmas decorations for the tree and decorate it together. My mom spends the day in the kitchen cooking and in between she goes to church. Christmas tree decorated and ready to be filled with dance and songs. There’s a lot of different kind of Christmas shows and movies on the television and on every channel you will see a small clock that’s counting down for 6 pm. Dinner time. On Christmas eve we don’t have a starter we just go straight to the main course. There is 3 different kinds of potatoes, normal white ones, brown potatoes that’s very sweet and then potato chips. 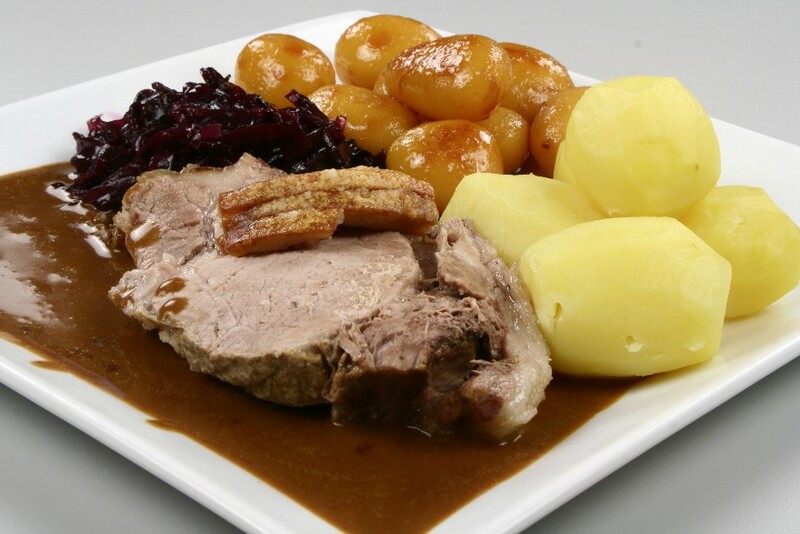 As for the meat we eat a roast we call Flæskesteg – It’s the same part as 삼겹살 is coming from. We also have rødkål which is red cabbage which is chopped and boiled in a special way and eaten hot. As the last thing we have brown gravy that’s made on the liquid from the roast. After this meal we take a break because it’s a very heavy meal. For dessert we eat the same rice porridge as for the Christmas lunch. However while we eat the dessert we play a game. In the porridge there is one whole almond in. So whoever finds it without eating it gets a present. The trick here is to hide it in your mouth and keep eating so no one that you got it. After dinner the coffee and tea is made and Christmas candy is prepared. Since our Christmas tree is upstairs we all go up and sit down and talk for awhile. Before we can open presents we have to kind of dance and sing. We gather around in a circle around the tree and sing Danish Christmas songs while we go around one way and the other way. I have always disliked this part because I thought it was boring. And then the Korean people came along. I must say I love my friends so much cause even without being able to sing in Danish they tried their best and made this a funny memories for me. So after this it’s present time. Normally we all have a bunch of presents from parents, in-laws, grandparents, aunts and uncles, friends and the rest of the family. But as a new tradition we only get one present each in order to respect my friends. So for us we open our presents either the 23rd or 25th but that’s just in my family’s case. While people are opening their presents we have the Christmas candy and coffee/tea and sometimes we even have some drinks. As an old tradition Christmas was celebrated by drinking. It’s called drinking in the Christmas. It’s not that common anymore as in the old days so we save it for new year’s. So when all of the presents are gone and people are drunk or tired we simply just go to bed. It’s been a night full of the Danish hygge. The 25th and 26th is celebrated with family and friends. Our classic Christmas lunches are at their highest point. If you aren´t having the lunch at your house you go to relatives house or friends houses. Since my family is small we always go to my aunt and uncles house on the 25th and spend the 26th with friends of the family. Since we have been eating a lot of food and fatty food for a couple of days straight, these days is giving us a great opportunity to take long walks in the fresh and cold air. If your family is living in the countryside there’s nothing better than going through the woods before you go back to eat some more. However I will warn you to be careful and not over eat because this is the busiest time of year for the hospitals because people can’t stop overeating. So now you know everything there is worth to know about the Danish Christmas. So to celebrate the coming Christmas you can check out the video below. It’s a song from the adults Christmas calendar. Even though they mix Danish and English together it shows some of the weird Danish humor we have. So Merry Christmas and happy tubår 🙂 … oh I mean happy new year’s (nytår). 관광객으로서 보기 힘든 평범한 덴마크인의 삶을 한국에 소개합니다. 한국인을 위한 최초의 덴마크어 교재 를 2018년 7월 한국에 출판했습니다. ---- I want to introduce a common Danish life to Korean rather than what tourists have been seeing. I published the first Danish textbook for Korean friends in 2018.